If you are a piercing addict or a rookie getting your ears pierced for the first time piercing aftercare and maintenance plays a huge role in how your piercing heals. In general for piercings there are basic do’s and don’ts. Take a multi-vitamin with zinc and vitamin C for faster healing. Make sure your bedding is clean and changed frequently while healing. If you suspect you have an infection, contact your piercer immediately. Don’t use Bacitracin, Neosporin, Rubbing Alcohol, Peroxide, Hibiclens, or Betadine. These products will hinder healing and cause more harm than good! 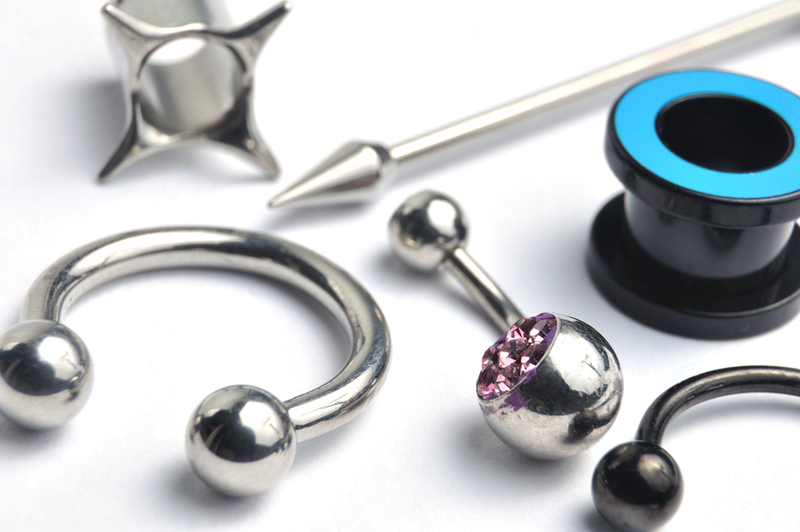 Avoid submerging your piercings in dirty water, such as pools, lakes and Hot-tubs. If you have to go in the water, make sure you cover your piercing with a breathable, non-water permeable wound sealant such as Tegaderm or Clean Seals (found at your local drugstore). Avoid sleeping on your piercing during healing and any other undue stress. NO PLAYING!!! NO TOUCHING!!! NO LICKING OR KISSING!!! Don’t change out starter jewelry until piercing is fully healed unless otherwise advised by your piercer. Every piercer advises their preferred method of piercing aftercare. Some recommend washing with a diluted soap and warm water, others recommend rinsing with a saline wash and sell aftercare products such as H20 piercing after spray. While H20 piercing is a great way to initially cleanse the piercing, it at times can dry up the piercing causing scar tissue to form, infections, and problems healing. This results in either repiercing or taking the piercing out totally. There is a new product on the market called, Organic Piercing Therapy, and it works wonders for new piercings, stretching of the holes, and piercing moisturizing and maintenance. It was formulated by piercers and a naturopath team, and contains no harmful chemicals, parabens, irritants, or creams. Here are the ingredients and how they heal naturally. Fractionated Coconut Oil- The benefits of coconut oil are attributed to the presence of lauric acid, capric acid, and caprylic acid. The human body converts lauric acid into monolaurin which is claimed to help deal with viruses and bacterial infections in piercings. When applied to the skin it forms a layer which protects the piercing from harmful bacteria, dust, and fungi. It repairs the skin tissues and helps heal bruising. Agrimony- This mild all natural astringent not only protects against infection, but slows down bleeding in piercings aiding in the healing process. Comfrey- Works as a pain reliever and anti-inflammatory. Its proper name Sympthytum means to heal, and this herb has been used in healing since the ancient times. It’s been used for centuries for healing bones. Scientific research has shown that the healing effects of comfrey are comparable to allatoin, a compound shown to speed up cell production and repair. White Willow Bark-The oldest recorded use of white willow bark dates back to the Chinese physicians in 500 BC. The bark contains salicin which the body converts to salicylic acid. This is the same compound acetylsalicylic found in Asprin. Gotu Kola- This herb is a great blood vessel strengthener. It is an anti-oxidant and anti-inflammatory, and also works very well in repairing and reducing scars, collagen synthesis, and skin regeneration. Gotu Kola is a very effective herb in preventing and reducing keloid scars as a resulting from infections and problematic piercings. Chickweed- Is known for its cooling properties. It is known to reduce dryness and itching associated with the healing process of piercings, while keeping skin moist. It also works well with skin burns, minor irritations, and rashes. Yarrow- Aids in healing by stopping bleeding naturally encouraging blood clotting. It also expels toxins, which prevent infections. Goldenseal- The root of goldenseal contains berberine and hydrastine which gives it a wide spectrem of antibacterial protections. This root wards off infection, letting the piercing heal and repair. Speedwell-This plant reduces itching associated with the healing process. Tea Tree Oil- This oil is an all purpose astringent, known for fighting fungal infections, bacteria, and wounds. It dissolves pus without damaging the skin, while also aiding in skin regeneration. Sea Buckthorn oil- Promotes healing and restoration of skin irritants primarily burns, sun damage, and open wounds. It is filled with many healing components such as large amounts of vitamin e, beta carotene, and omegas 3,6,9. It has natural UVA protectors which work well for new tattoos and piercings. Tamanu Oil- Is an oil found in the South Pacific, that works well for skin and muscle irritations. It serves as an anti-inflammatory and is is the only oil known to be able to be absorbed through all 3 layers of the skin. It reduces pain and begins working as soon as it is absorbed into the skin. Grapeseed oil- Is a natural preservative extending shelf life of the product while keep piercings nourished. Vitamin E- While acting as a natural preservative, vitamin e protects against dust and infections while repairing and reducing scar tissue. Safflower- This natural moisturizing agent contains linoleic acid which help maintains the skin’s elasticity, which works well for stretching holes. Posted on December 4, 2014 February 23, 2018 by emilyturner23Posted in Health & WellnessTagged body modification, organic piercing therapy, piercing aftercare, piercings. This was very informative! Great article!